In the last year or so, we have seen a sharp uprising in the need for book scanning and the conversion of books to digital formats. These range from anything from PDF right up to e-book formats such as the ePub and the Amazon Kindle exclusive .mobi format. 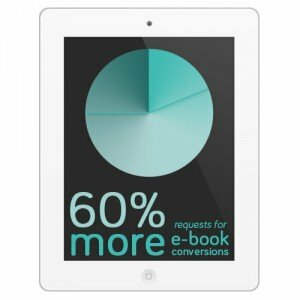 Although there is always a demand for PDF versions of books, the biggest change in requests has been for e-book formats. We put this down to the significant rise in popularity of e-readers including Amazon’s Kindle and Kobo’s Touch and tablet Vox, as well as massive sales for tablet devices such as the Apple iPad, which offer compatibility with both Amazon and Kobo’s apps. The prospect of republishing books both physically as well as digitally has become a huge draw for some even those firmly against the digitisation of publishing. Recently deceased author Ray Bradbury, most famous for hisÂ high-tech, book-burning future novel, Fahrenheit 451, recently had to recant due to publishers insisting that to republish his novels he would have to accept that they also needed to be distributed digitally. This is an increasingly apparent attitude amongst publishers, such is the demand for e-books. Recently Amazon themselves declared that they were now selling more digital books via their online store than physical ones, a feat not expected to be seen for years from now. Although it has become something of a controversial arena for authors and publishers alike thanks to recent price fixing lawsuits against the likes of Apple, the ebook market has become one of the most profitable around and it continues to grow. Amazon have also recently improved their product range here in the UK with the all new Kindle Touch, a long overdue upgrade to the standard budget Kindle, as well as the promise of their Android based tablet the Kindle Fire. The likes of PDFs and text-searchable PDF’s also work on e-reader devices but lack the capabilities of an actual e-book which can cater to facilities such as a contents page as well as device specific operations such as text-highlighting and bookmarking. The ePub format is always a popular choice as it stretching across thousands of devices in its compatibility, but it misses out on the Kindle compatibility, the Kindle already controlling at least 60% of the ebook market, so more often than not people are opting for both, especially as with an ePub you can submit it to the Apple iBook store and it will be converted to Apple’s own exclusive format at no extra cost. If you’re contemplating making your book(s) digital, then it’s not a hugely expensive project too, especially considering what you could get back in future sales of your books. “e-book’s are going to be here for a long time to come and this way you’re future proofing your income as well as the actual books themselves”, says Pete Goring, head of Pearl Scan Solution’s book scanning department.